mit rezepten, infos u.v.m. zum thema fisch. die handgezeichneten comics stammen von der talentierten chiara de cesare. 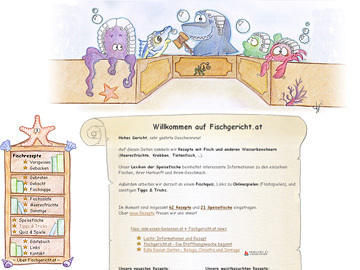 i present to you our newest online project: www.fischgericht.at is going to be our recipe archive for all things with fish. the design is a pun on the german word for fish dish. the second part of the word, “gericht” means either “dish” or “court of justice”, depending on context. all the comics were hand-drawn by my good friend (and extremely talented drawer, even though she’ll say that i’m exaggerating) chiara de cesare.